There are many ways to bleed the carcass of the animal and they all serve our own purpose and use. Some of these ways are better than others, but they all do the same job. We all know that the quick bleeding of the carcass after the animal has been felled is as important for the meat quality as the shot placement or a nice, clean gralloch. As a trained and qualified hunter myself, I try to bleed out the carcass in less than 10 min after the animal was shot. By doing so we make sure that most of the blood escapes from the carcass before it clots up in the arteries and muscles. By getting rid of unwanted blood we increase the shelf life of the meat and improve the taste, which in game meat are the two main things we are after. The bleeding itself is not the only thing necessary to do justice to the game meat. After you get rid of most of the blood, the carcass itself needs to be treated appropriately. 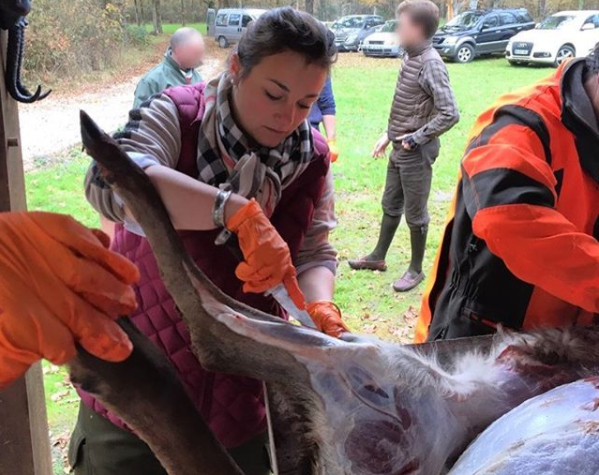 This involves examination of the carcass, temperature control, handling, hygiene, transportation, equipment and other considerations, which are all very important. Clearly, in the winter months, reducing the temperature of the carcass is not a problem; but in early spring or autumn, and especially in summer, it can be very challenging. After the gralloch is dealt with, the temperature of the carcass must be constantly kept low until it gets to the freezer. The most common way of getting the temperature down is to freeze 2-3 bottles filled with water a couple of days before the hunting trip, and then place one of them in the cavity of the carcass, with two positioned around it (the bottle being placed inside the cavity should first be wrapped in kitchen towel to avoid frost bite on the inner fillets). Disposable gloves should be used at all times when the hunter is working on or handling the carcass. Items such as knives, gloves, bottles with frozen water, insect nets and sledges must only be used for one carcass. If the outing was very successful and the hunter managed to get more than one animal, a separate knife is one of the most important things. It is even advisable to use different knives when removing the hooves, cutting through the skin and working inside the cavity. Once in the freezer, if you intend to sell on the carcass, it needs to be tagged and the required information must be entered. To be clear, if the carcass is for the hunter’s own consumption, none of the above is required. Three basic rules which are good to follow when you are dealing with game meat are: Fast, Cool and Clean.